Buy Cara (aka) Lady Flame a coffee. ko-fi.com/ladyflame - Ko-fi ❤️ Where creators get paid by fans, with a 'Buy Me a Coffee' button. Amateur author and illustrator who is a long time fan of Japanese manga and anime, and a more recent fan of Korean and Chinese manwa & donghua. 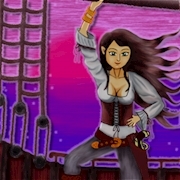 Manga-style Digital Artist, Writer of Poetry, Prose, and now the serialised story 'The Sea Witch' on Webnovel and Tapas. For my full gallery over almost 15 years of art and writing, check out Lady-Flame @deviantART. Secured Payments. Support goes to Cara (aka) Lady Flame's account. Upgrade Cara (aka) Lady Flame to a yearly Gold Membership with a one-time payment.